Grilling peaches adds an extra layer of flavour to this refreshing summertime drink. I like to make mine extra-tangy by using both yogurt and kefir, but you can use milk instead of the kefir for a less tangy variation. Preheat a lightly-oiled grill (or a grill pan) over medium-high heat. Once the grill is good and hot, place the peaches cut-side down over direct heat, and cook until you have nicely charred grill marks (about 2-3 minutes). Allow to cool to room temperature, then roughly chop. 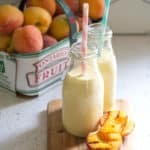 Using a high-powered blender, puree the peaches together with the yogurt, milk, maple syrup and cardamom until smooth and well-combined. Drink immediately, or transfer to a pitcher and refrigerate until ready to serve.